The type of people who can be helped by Clematis vitalba (also called traveler's joy) are those who tend to live in a dream world and take little interest in day-to-day events. Clematis types may be dissatisfied with life and have impractical ideals. Treatment with clematis can stimulate creative potential and thus encourage people to attempt to realize their dreams and become more focused. This woody climbing vine can grow up to 30 ft. long. 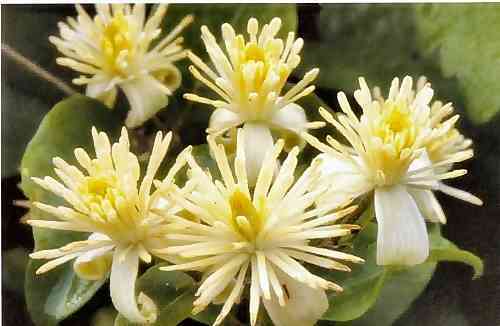 Each fragrant blossom is made up of 4 greenish-white sepals and innumerable feathery filaments. Because these filaments turn silvery and thread-like in the fall, this type of clematis is sometimes referred to as "old-man's-beard." © 2018 Anbanet.com Newport RI. All Rights Reserved.